Electricity is usually the first thing to go out during a natural disaster, which definitely makes things hard when it comes to cooking. There are other options that are easy and inexpensive to make that will serve you well, like the; coffee can stove and the rocket stove. They can be used for cooking and boiling water not just when you are camping or backpacking but it is also very useful during a power outage or a natural disaster. These varieties of stoves are just one of the many items that should be at the top of a survival kit list, but the one most campers and survivalists will appreciate is the coffee can stove and as the name implies, it is made out of coffee cans. 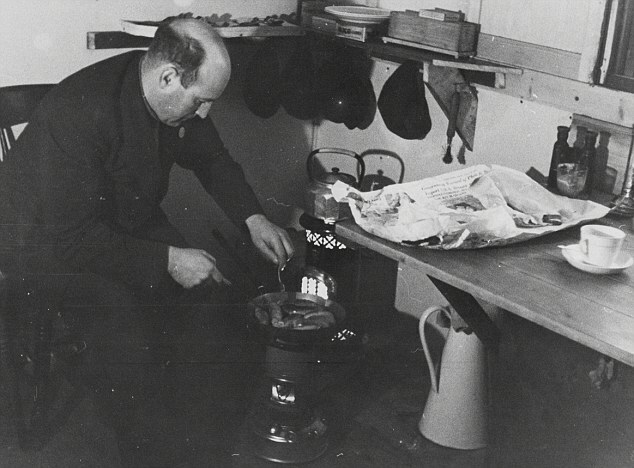 The stove has been in existence since the period of America’s great depression and was used by many families for survival. The beautiful thing about this stove apart from the fact that it is portable is that you can make it yourself, instead of buying. 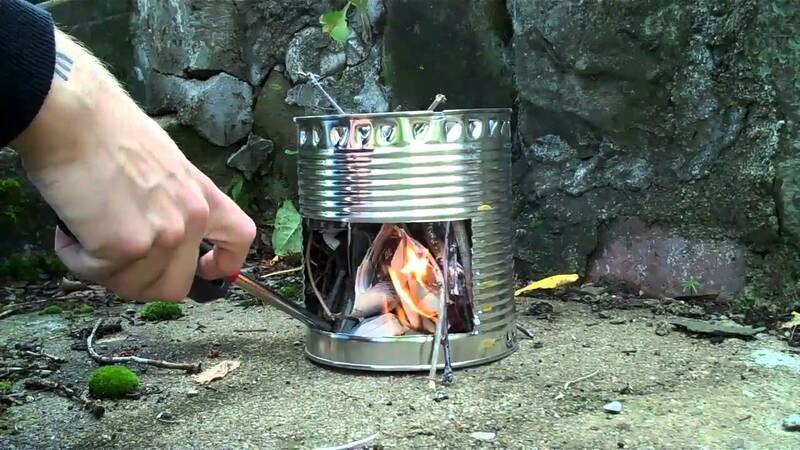 It does not require expensive materials and can be made from empty cans and uses very little kindling to get it going. It is a really cheap way to cook your food and also stay warm. It would be much better if you could harvest fresh produce from your own greenhouse. It needs really simple tools to build that can be found anywhere, even among your junk. It has the less environmental impact than the open fire does. It can create the same amount of heat the wood fire does and uses less fuel. The next step is to drill small holes near the bottom of the can, the holes are to exhaust vents so that the fire isn’t suffocated. Drill four smaller holes and take your coat hanger, cut two straight rods from the hanger and run the rods through the holes. They are the support for your cooking pot. 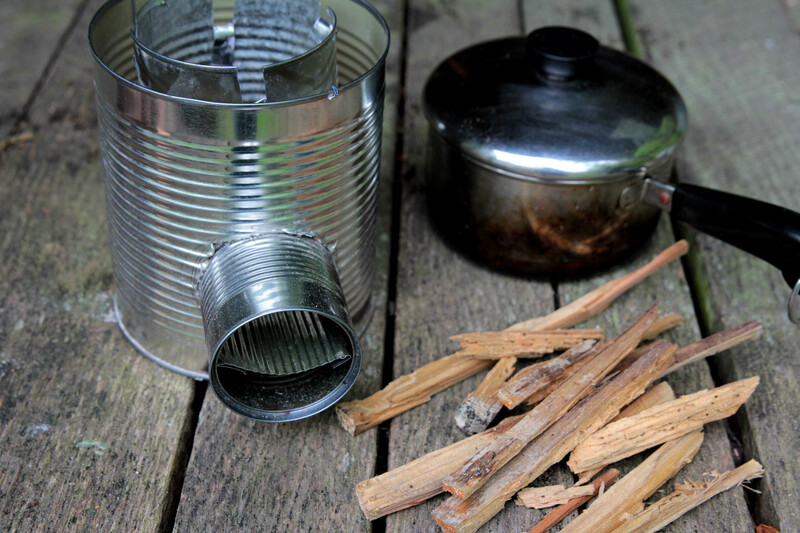 Then gather a couple of twigs and put them at the bottom of the can and light the fire, your coffee can stove is ready to start cooking. The rocket stove, even though it is used mostly as portable cooking stoves, can be used to create heaters for heating. So it does not serve just the function of cooking. This stove is used mostly in third world countries but it is now making a comeback in developed countries and survivalists, campers and hikers seem to have taken to this type of stove, which is portable and reduces pollution that is found in an open fire. The fact that the stove is open at the point where the wood is placed, allows a lot of oxygen into the unit. And as the fire builds up, the burn tunnel slowly heats up and hot air moves up the heat riser and this draws quite a lot of air behind it. This air moves to the feed tube and also across the wood, which creates the same effect an air-blower will have on the fire. The air intake in conventional wood stoves is quite small and this creates a lack of oxygen which will choke the combustion and leads to incomplete combustion, so a lot of smoke is created. If combustion is complete, what should come out of the chimney should only be carbon monoxide, which means that there should be no smoke. But once you see smoke, it means that the combustion was incomplete and there is wasted energy. But with the rocket stove, there is little or no smoke, which means that the combustion is complete. There is also the environmental advantage in using the rocket stove as opposed to the wooden stove. It consumes less wood which helps as it reduces the harvesting of wood and helps the environment. Before you start working on your stove, practice safety first by putting on the heavy-duty gloves, working with aluminum can be tricky. Then make a circle, the same size as one of the smaller cans on the #10 can use the tin snips to cut out the circle drawn on the can. Make sure the small can will fit into the hole. The next step is to take the cut out piece on the #10 can and cut a circle that size on the smaller can. Place the small can inside the #10 can with the holes facing the same side. Then with the second untouched can, cut off the lid and make 1.5inch tab cuts around the can and fit the can into the holes in both cans, you can fold some of the tabs but the can have to fit into the holes. Take the top lid of the #10 can and cut a hole the same size as the smaller cans. Then put insulation into the spaces between the large can and the small can. Any kind of insulation will do as long as it is not the flammable type. Fold down four of the tabs cut in the big can and place the lip with the hole in it on top. Fold the remaining tabs on top of the lid to hold it in place. Then use your scrap pieces to make a shelf, cut a rectangle piece with flaps to fit inside. Put the shelf in place and fold the flaps to hold it down. Lastly, use the wire hanger to create a handle for your stove and you are all done. To get your rocket stove working, just put small pieces of wood on the shelf, light it up and you are ready to start cooking. It is portable and very effective. But there are different materials that can be used in creating your own rocket coffee can stove; it does not necessarily have to be made of tin cans. Cinder blocks are another good material, to make this, you will need three cinder blocks, and one H shaped block and an old grill. You start by placing one of the blocks horizontally, then another one in front of it in a vertical position. Then take your H block and place it on top of the block which was placed in the horizontal position. Finally, place your last block, on top of the H block and your stove is ready. The bottom block serves as the combustion chamber while the other two blocks serve as the chimney for the stove. To light the stove, you need to fill the first hole at the top of the stove with old cardboard, newspaper or any kind of available kindling. Light it and keep adding little kindling until the fire is blazing nicely. Then you feed small pieces of wood into the hole in front and you keep pushing them in so they can burn nicely, then when you are ready to cook, place your grill at the top of the stove and your pot on top and you are ready to start cooking. But if you do not have the time or are just too lazy to make your own stove, then you can simply purchase a deadwood stove which is a kind of rocket stove and get cooking. Enjoy your outdoor grill or a cooked meal during a hike or camping. The deadwood stove’s heat can be regulated with the different sizes of and amount of sticks that are used for fuel. In no time, you will learn how to regulate and maintain low heat for meals like eggs, pancakes and other meals that do not require a lot of heat. But if you need to boil water or fry up some food, then more heat is to be generated. A larger quantity of small sticks will be best for this situation but as you keep on using the stove, you will understand what kinds of fuel work best in different cooking situations. Always be safety conscious when using the rocket stove, they are not to be used indoors as they emit carbon monoxide which is quite deadly. Also, have a bucket of water or a fire blanket by your side ready to throw on the fire just in case it gets out of hand. Be careful when feeding the flame as we all know fire is unpredictable and can burn your fingers. With these stoves, you will never have to worry or panic during a power outage as you will have the advantage of having another alternative when your electric cooker does not come on. 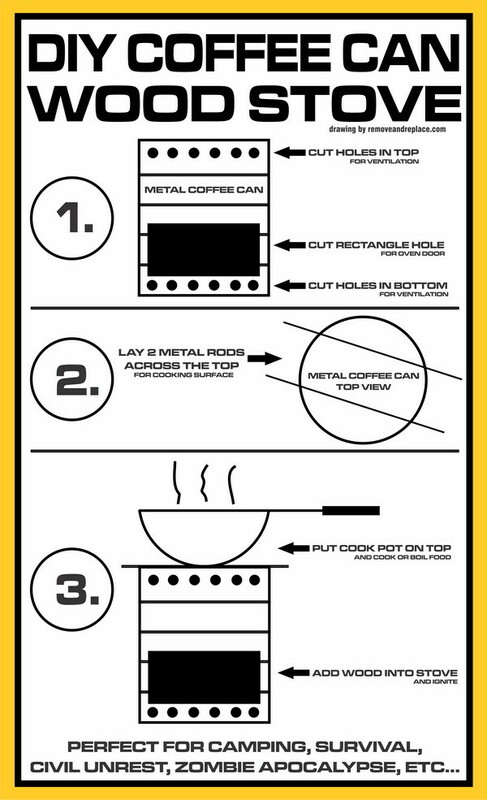 So, there you have it, just follow the steps mentioned above and in no time, you will have your very own, handmade rocket stove which will definitely be useful for camping, outdoor cooking, and any unforeseen natural disasters.